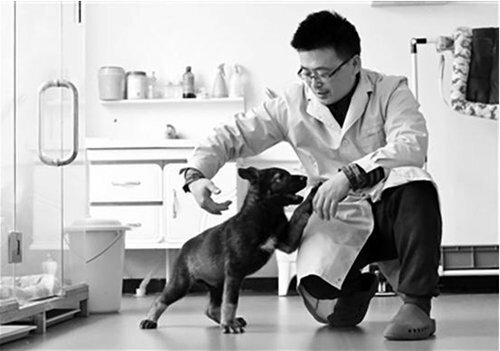 Two-month-old Kunxun, China's first cloned police dog, plays with an employee from the scientific lab. Photo: Courtesy of Science and Technology Daily. China's first cloned police dog, 3-month-old Kunxun, has begun training after arriving at a police base in Kunming, Southwest China's Yunnan Province earlier this month. Kunxun is a clone of Huahuangma, a 7-year-old female police sniffer Kunming Wolfdog which belongs to police in Pu'er, Yunnan Province. Huahuangma was recognized as the Ministry of Public Security first-class meritorious dog in 2016, for her contributions in investigating murder cases. According to a Tuesday report from Science and Technology Daily, it would take four to five years to train a dog like Huahuangma, and will cost 400,000 ($59,560) to 500,000 yuan. Kunxun was born on December 19, 2018 at an experiment base of the Beijing-based Sinogene Biotechnology Company and Yunnan Agricultural University with the support of the Ministry of Public Security, the company said on WeChat. A study revealed that Kunxun's DNA is 99.9 percent similar to Huahuangma's. The birth of Kunxun provides the possibility of extending animal clone technology to police dogs, and will significantly reduce the time to train one, Zhao Jianping, Sinogene deputy general manager, told the Global Times on Tuesday. Using somatic cells can preserve the quality breed of the Kunming Wolfdog, and make it possible for volume production of such dogs, Zhao said. He also noted that the cost of cloning remains a bottleneck for mass production. Zhao did not reveal how much it would cost for Kunxun's clone. Wan Jiusheng, a leading researcher at the Kunming Dog Base of Public Security, told the Science and Technology Daily that Kunxun shows a better potential than the regularly bred Kuming Wolfdogs in a series of tests. Wan said Kunxun will be able to become a police dog when it is about 10 months old. China's Ministry of Public Security officially recognized the Kunming Wolfdog as a breed in 1988. A police officer at the Shenyang Dog Base of Public Security who requested anonymity told the Global Times on Tuesday that preserving the police dog blood has always been a challenge for breeders, as traditional breeding methods would dilute the original, and the next generation's genes will be largely beyond control. The successful police dog clone technology would address those problems and lower the elimination rate of police dogs at the puppy training stage, he said. However, such technology does not mean that the mass production of police dogs has already arrived, as factors like the surroundings and trainers' skill also play as an important role, he noted. Wan said the research group is planning to establish a national police dog somatic cell bank to fully preserve and utilize top-notch police dogs. South Korea started cloning police dogs in 2007, which performed tasks well, according to Wan.